Whatever part of France you are looking to buy a house in we have a quick guide for you here. France is very diverse and property in France follows this rule in a very distinctive way from 'Colombage' houses in Normandy, Fisherman's cottages in Brittany, holiday homes in the Loire and to stunning Villas in Provence. There is something for everyone! Each region is divided into smaller departments with each having its own identity and strengths. We have property for sale in all of the following regions and some in other region of France. Contact us if you are looking to buy French Property and gain access to the best network of English and French Estate agents. The Aquitaine region, capital city Bordeaux, is one of the greatest historic regions in France; it is also one of the largest and most varied regions stretching from the foothills of the Massif Central to the north, to the Spanish border in the south, with around 200 kms of coastline. In the Middle Ages, Aquitaine was allied with the Plantagenet kings of England, and the region has many historic connections with the British Isles, especially through the wine trade and now tourism of course. Aquitaine is a varied region for example in the northwest part of Aquitaine, comprising the departments of the Dordogne (24) and the Lot-et-Garonne (47) the landscape is of gentle hilly country, with large vineyards in the lower lying areas, and with woodland and mixed farming on the higher north east area. The middle of the region, following the line of the Gironde estuary is one of the most famous wine-producing areas in France. Bordeaux, regional capital and capital of the Gironde department (33), is a magnificent city set on the Garonne river. The southern part of Aquitaine is made up of two distinct areas, the departments of Landes (40) and the Pyrénées-Atlantiques (64). Dordogne (Dept 24), Gironde (Dept 33), Landes (Dept 40), Lot-et-Garonne (Dept 47), Pyrenees-Atlantiques (Dept 64). However, the abiding image of Brittany for many is its quaint fishing ports and rugged coast line. It is the western most point in France, stretching out into the Atlantic with old maritime fortresses and light houses dotting the coastline. We have some great coastal property for sale in Brittany, France. Finistere (Dept 29), Cotes-d'Armor (Dept 22), Morbihan (Dept 56) and Ille-et-Vilaine (Dept 35). While it does, just about include the point which is the geometric "centre" of France, the region known as "le Centre" does not generally coincide with the middle of the country; confused?. With its proximity and excellent transport links with the U.K, Normandy is the ideal choice for those looking for either a holiday home or permanent residence. Along with the rolling countryside of the 'Swiss Normande" area it is not surprising that Normandy is one of the most visited regions of France. We have many Farmhouses for sale in Normandy, France. Upper Normandy: Seine Maritime (Dept 76), Eure (Dept 27). Lower Normandy: Calvados (Dept 14), Manche (Dept 50) and Orne (Dept 61). The Pays de la Loire includes some of the most sought after property in France, but also offers some of the best value. 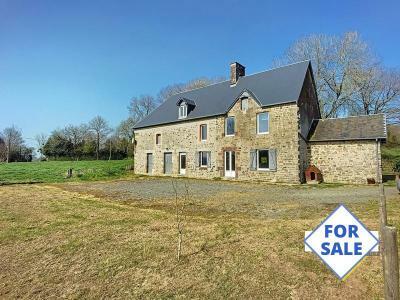 We have many varied property for sale in Pays de la Loire, France. Loire-Atlantique (Dept 44), Maine-et-Loire (Dept 49), Mayenne (Dept 53), Sarthe (Dept 72), Vendée (Dept 85). The Green Venice of the Poitevin Marsh which you visit by boat will enchant you with many scents and colours. Poitou-Charentes is also a place looking towards the future in the shape of the Futuroscope Park which attracts visitors from all over the world. Lots of Villas for sale in Poitou Charentes, France. And don't forget the stunning and exclusive island of Ile de Re where life is at a completely different pace. Charente (Dept 16), Charente-Maritime (Dept 17), Deux-Sèvres (Dept 79), Vienne (Dept 86).